Traditional children’s toys are still one of the largest and fastest-growing segments of consumer purchases in America even as video games and electronic devices top many holiday wish lists. And if you’re like many people this holiday season, you’ll be looking to purchase a toy for the child or children on your shopping list. While toys always make for great holiday gifts and have the ability to put a smile on just about any child’s face, without the proper care and attention, they can also pose a serious danger, too. Is Toy Safety Really an Issue? Although many parents and grandparents can probably attest to the fact that many children’s toys are safer today than they were in the past, toy-related injuries are still prevalent in the United States. How prevalent are they? According to the U.S. Consumer Product Safety Commission’s latest report, there were an estimated 251,700 toy-related injuries treated in hospital emergency departments in 2017 alone. And of these reported injuries, 69 percent happened to children younger than 12 years of age. Age and usage guidelines provided on the packaging of toys and in online product descriptions aren’t just simple recommendations for who might enjoy them. These important guidelines are generally outlined to provide parents an idea as to whether or not a toy is safe for their child to use in the first place. Whether you’re doing your shopping online or in a store, take a few extra minutes to read the warnings and instructions for toys you’re considering. It’s also a good idea to read online reviews and user feedback if you’re still not sure. Even if the packaging and warning labels don’t indicate a particular hazard, use your best judgment about whether or not a toy is right for your child. If it looks like something that you could see them misusing or having an accident with, it’s far better to be safe and look for something else. If you have multiple children that vary in age, it’s important to teach older children about the dangers their toys can pose to their younger siblings or relatives. 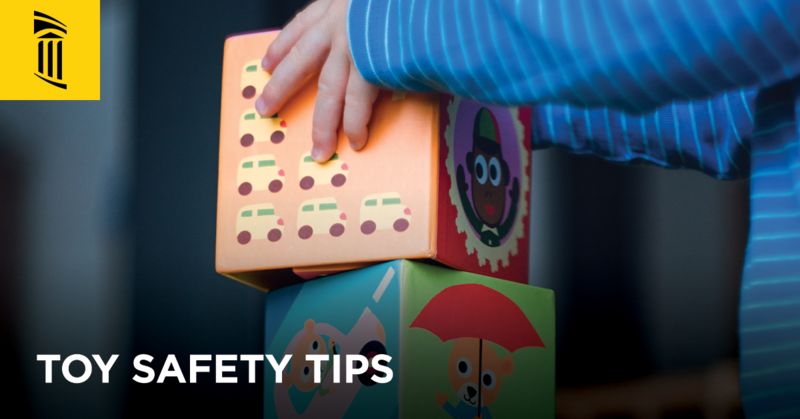 If they have toys that contain small pieces (choking hazards) or sharp points, instruct them to put them in places where younger children can’t get to them. One of the easiest — but often overlooked — ways to prevent toy injuries is storage. Toys left on the floor across the home pose a tripping or falling hazard for many young children, so it’s smart to think about how you’ll store your child’s toys before you buy them. All it takes is a simple bin or container to keep your kids safe after playtime has ended. After the holidays are said and done, it’s always a good idea to be on the lookout for toy-related recalls. Even though many of America’s top toy companies test their products for safety, accidents do happen, and toy recalls are not unheard of. If there’s a previously undiscovered safety issue with a toy that you purchased for a child, you’ll want to know what you should do about it. You can keep up with the latest children’s product recall alerts from Safe Kids Worldwide, a nonprofit organization dedicated to preventing childhood injuries.